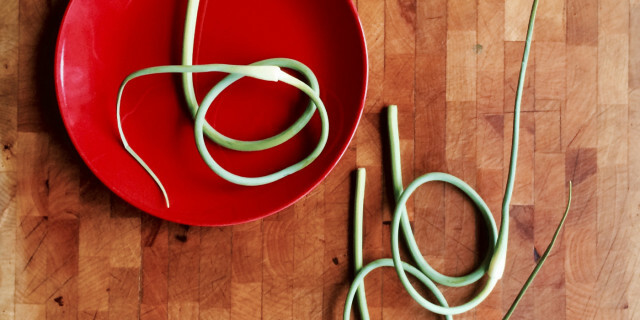 Garlic scapes are a true seasonal treat. Like ramps, no one has yet figured out a way to grown them 4,000 miles away and then ship them to us in the middle of December. Take advantage of them when they’re around (early June in these parts). If your farmers’ market is host to garlic growers they will sell scapes in early summer. The scapes are always cut off so the bulbs grow bigger and fatter. Pesto is the gateway recipe for garlic scape newbies. It’s the perfect way to test out the garlicky-chivey flavor of scapes. Don’t limit the pesto to pasta, though. Spoon it over grilled chicken or fish, stir it into gazpacho or spread a little goat cheese onto a crostini or cracker and top it with a dab of pesto. This makes a thick, dabbable pesto, perfect for topping grilled things. If you’re pairing the pesto with pasta, save a little pasta cooking water and do The Pasta Three-Step. Garlic scape pesto freezes well. If you grow garlic you already knew this. Process the scapes and walnuts to a chunky paste. With the motor running, pour 1/3 cup olive oil through the feed tube. Process to a fairly smooth paste. Take a look at the pesto—if the consistency is where you want it, scrape it into a small bowl. If you’d like a smoother, looser pesto, drizzle in a little more oil and process for a few seconds and then scrape it into a small bowl. Stir in 1/3 cup Parmesan and the lemon juice and taste. If you like it cheesier, add a little more cheese. Season with salt and pepper. Store the pesto in a small jar in the refrigerator for up to a week. Float a very thin layer of olive oil over the top to keep the pesto from turning dark.